Marina East (N1 17.692 E103 53.097) – this plot of land is destined to become some 18 holes golf course. This part of Singapore used to be the sea, but has been reclaimed land. Lies dormant for decades, and it has developed its own ecological system. 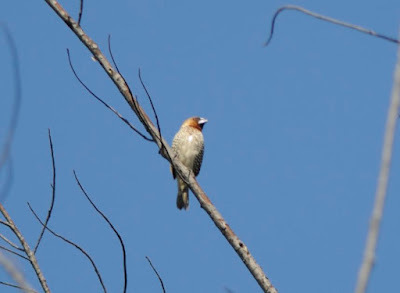 There are much biodiversity here in terms of plants, birds, insects and reptiles. For mammals, we somehow might have missed them! Development works have begun, and we were here to enjoy the biodiversity before they disappear under tons of earth for the manicured lawn! 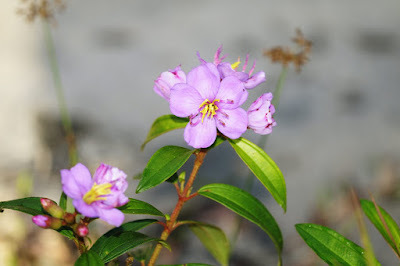 The first plant that I was introduced was the Singapore Rhododendron (Melastoma malabathricum). I was told that the active ingredient of the leaves is used to make the "Po Chai" Pill which is very good to stop tummy problem. 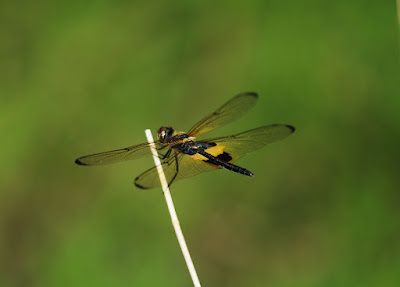 There is a pond where many species of dragonfly dwell. As there are dragonflies, there will be the predators. 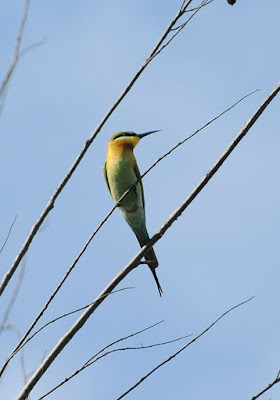 The predator for today is the Blue Tailed Bee-Eater (Merops philippinus), the other predator but on the smaller insects is the Pacific Swallow (Hirundo tahitica). 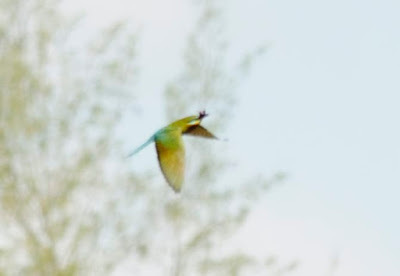 The Bee-Eaters were very agile hunters. 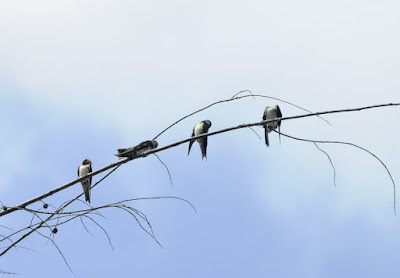 First they perched on the branches of trees, scanning for suitable preys, and then they launched, and in an aerial acrobat, they will have their meals in their bead. They will then head for another tree, to finish their meal, and the cycle repeat itself. Managed to capture some of the action, but some of the shots are not very cleared, but you still can make out the pictures. 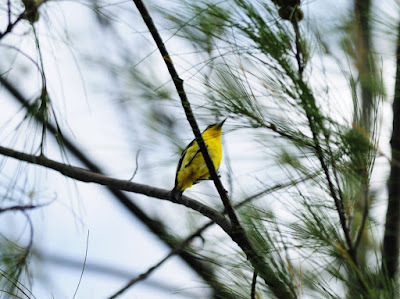 A very beautiful bird, this is the male Common Iora (Aegithina tiphia). We came across an abandoned Tailorbird nest. 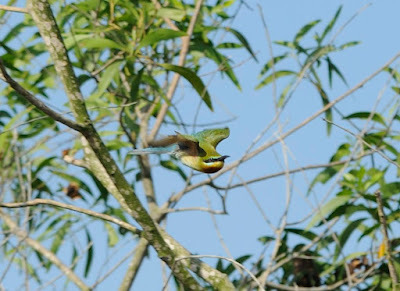 Without thread and needle, the Tailorbird uses the thread of the spider web, and with its bead, it stitches together the leave. 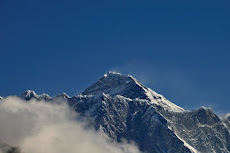 The stitching is done, in such a way that the bird and its young can safely ride out the wind and rain. Incredible workmanship! 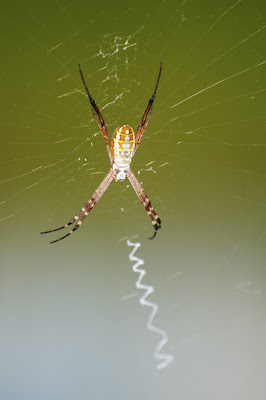 We came across this species of St Andrew Spider (Argiope catanulata), the belly is with golden stripes. 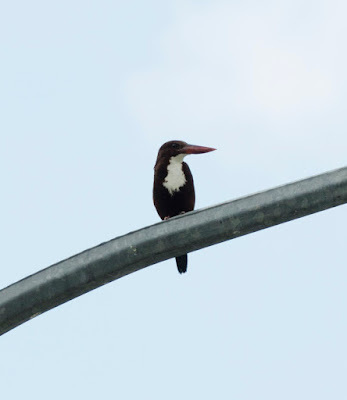 It has been mentioned that this species is quite widespread, and flourish in undisturbed swamps or ponds. 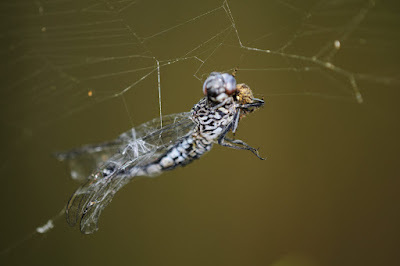 The Bee-Eater is not the only predator of dragonfly, spider with their beautifully crafted web will snare the unwary ones, dragonfly and any things that end up in their web. 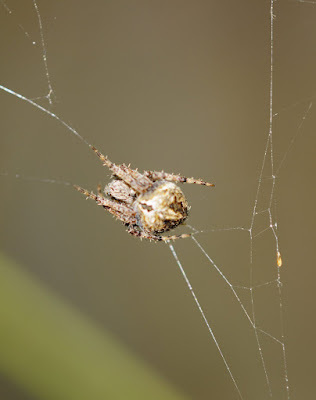 In this case, the dragonfly has been sucked dry by this spider (species unknown). As mentioned, there is a pond here and many dragonflies were seen mating and depositing their eggs into the water. These are some of the better shots I have taken of the dragonfly. 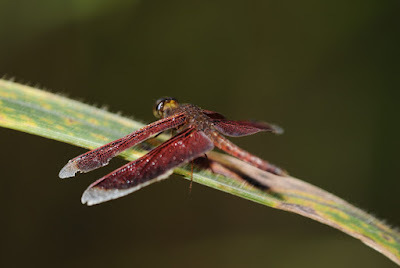 This Red dragonfly (Nannophya pygmaea) is the smalles dragonfly in Singapore. 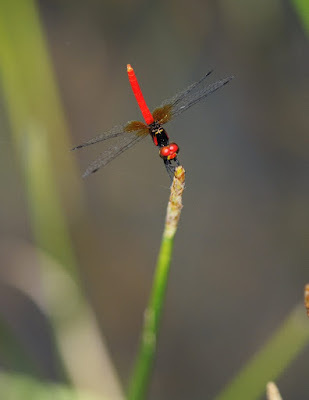 This is the Male Pygmy Dragonfly. When a land is newly reclaimed, certain species of plants will be the pioneer, the Seashore Morning Glory is one of them, being a creeper, their creep on the ground and its roots provide much support to the soil. With this pioneer plant, then the second wave of plants will settle in, notably the Casuarina with its deep root. Other plants also take root, and compete for space and light. Most of the plants here are unknown to me. 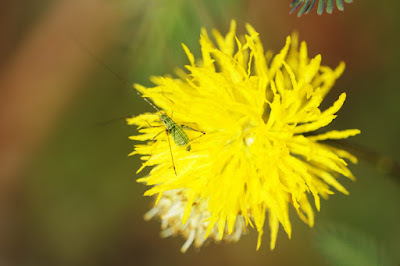 Below I have taken close-up of two species of Mimosa. 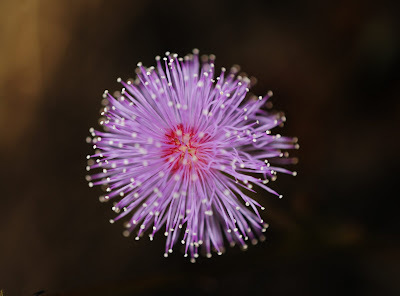 This is the common Mimosa (Mimosa pudica) with its distinct Pink Flower. In this area, we also come across the yellow Mimosa, the flower is very different from the pink mimosa, the leave has a whitish band across the leaf vein! 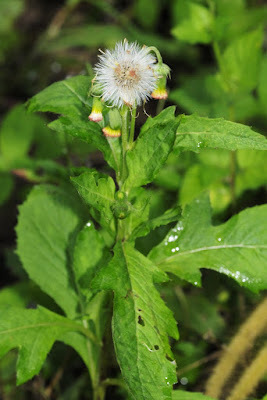 Fireweed (Erechthites valerianifolia) looks very much like the dandlion. 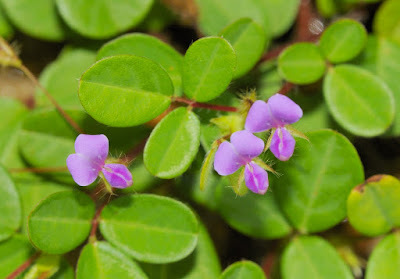 These tiny purple flower is called Clover-leaved Desmodium (Desmodium sp). Unfortunately, took this shot without placing a ruler for perspective. 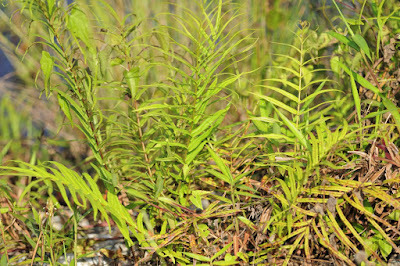 This Unknown Plant has been identified with the help of LK. 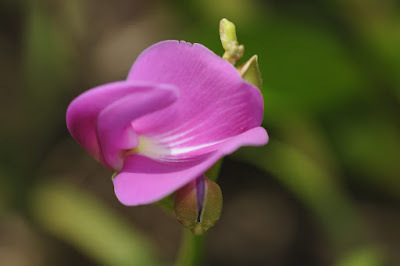 "the solitary flower belongs to the Family: Passifloraceae. 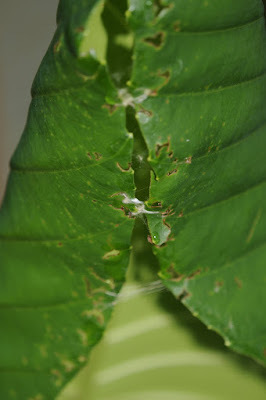 This climbing species will produce 2 types of leaf-shapes, a simple pinnate and also a trilobe leaf. 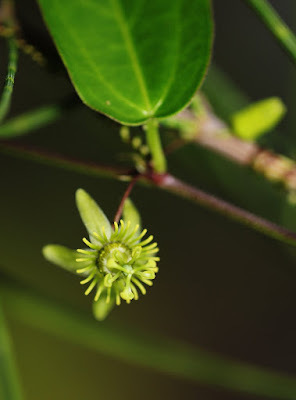 It is non-native (imported weed from S. America), name: Passiflora suberosa"
It is inevitable that a golf course will be developed here, it is only hope that the pond and trees, and possibly some of the shrubs will be left undisturbed, to be made as part of the course. Better still, as a form of obstacles. I personally do not see why this is not possible! wonderful, didnt realise that Marina has so much life! Yes, there is much biodiversity but it will be a pity if all these are covered in dirts for the golf course. Should visit this place but with care, as it is also "restricted" area.